The McCropders have been doing a fair amount of orientation this summer, most of which was done two weeks ago at the World Medical Missions headquarters in Boone, NC. We have also done some self-administered unofficial “orientation” to prepare us for vehicles and transportation in developing countries. The first unofficial transportation orientation session involved Eric and me (Jason) on a memorable drive to Nashville. We drove down there to bring the last remnants of their belongings to be stored at Eric’s parents’ house. We stuffed my Camry (which has 196,000 miles) full of books and other heavy objects, and we precariously perched a bike on the back. Then we hitched on a trailer loaded down at 200% capacity with a bedroom set among other things. This 12 hour drive (which normally takes 8 hours) was punctuated by multiple stops to adjust (and finally cut off) the tarp covering the trailer, a stop for a blown cylinder head cover gasket, and untold glances in the rearview mirror to be sure everything was still there after every bump we hit. This exhausting trip reminded me of so many family vacations just like it while growing up in Kenya. The second unofficial transportation orientation session involved some old dirt bikes. This is a common and often necessary method of travel in Africa, which both John and I remember fondly from our childhoods in Africa. I rebuilt a few old dirt bikes during the past year, and one free day this summer, John and I took them for a test ride at a friend’s farm. The dirt bikes were just as fun as we remembered, and now we feel re-oriented to this form of transportation as well. On the drive down the mountain, after our week of Samaritan's Purse orientation, we were discussing what our favorite part of the week was. We both had the same answer, namely the chance to get to know the other medical families that are participating in the Post-Residency Program for the next two years. There are a total of 15 physicians this year in our program, and the McCropders represent 4 of these. We got a chance to meet some of these folks back in April at the Bristol conference (pictured below), and at this orientation, there were 4 other families besides ourselves. 2 Family Practice docs with their families, going to Shell Hospital in Ecuador. An OBGYN going to another hospital in Kenya, and an Infectious Disease doc and his family going to yet another Kenyan hospital (Kijabe, where Jason grew up). 1. It reminded me of band camp. Not that I ever went to band camp, so maybe I shouldn't use this analogy. But it seemed that, in high school, band people felt like non-band people didn't quite understand why they invested all this time in band, and even though others really appreciated music, there was a different comraderie among the fellow band members (I'll refrain from the classic "band nerd" descriptor, having seriously no power to use such a term). This comraderie was most manifest at band camp, where they could relax and exult in other people really understanding why they loved band. 2. More importantly, these are amazing people. We enjoy looking back at the wonderful and diverse relationships that have filled up our lives, and each one of these other post-residents are now on that list. 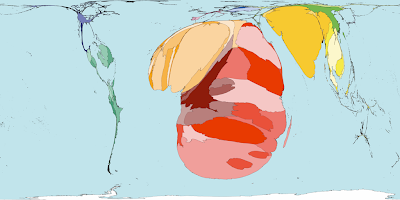 Their personalities and their committment are inspiring, and we have fullest plans of trying to recruit each one of them to join the McCropders in the future, at which point we will be the "McCropderbenefrankapleys". With great joy we introduce to you the newest addition to the McCropder team. Baby Abi's adoption was finalized this week in Addis Ababa. Praise the Lord! We Faders travel to Ethiopia in early September, and if all goes well, we bring Abi home to Michigan on September 13. We are so thankful. Here are a few pictures of our beautiful new little girl. We took these pictures when we were in Ethiopia in May. Abi is now eight months old and seems to be growing well, despite her early malnutrition. Currently, Abi is approximately the same size as her new friend, Plumpy Nut (who is five months younger). Praise God for Abi Fader - and for the adventures he has in store for all five McCropder children. 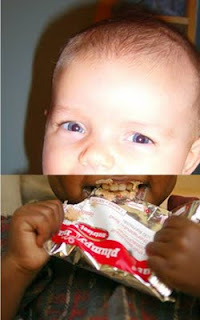 Every little baby is a "peanut". You have probably used this moniker yourself. Maggie was also a "peanut". But at the 96th percentile for length and the 99th for weight, she is a peanut no longer, and I have been stumped as to how to refer to her. But this was just one of the many solutions that our Samaritan's Purse orientation afforded. We learned about the extensive disaster relief efforts of SP, including the amazingly complex system of delivering aid in the midst of famine, natural disasters, war, or poverty. And they have some interesting tools in their toolbox, such as the Pur water sachet, which when stirred for 5 minutes into nasty river floodwater, produces 10 liters of pure water by coagulating everything else into a sediment at the bottom. But most pertinent was the reminder of Plumpy Nut, a peanut-based nutrition treatment for malnourished children in famine areas. I had heard about this before, but this was timely, because I realized "I don't have a peanut. I have a Plumpy Nut!" Will this give my daughter a complex? Time will tell. Just a bit of cross-blogging that McCropder readers might find interesting. Rachel's thoughts on Caesar Gives Back and Alligator, Simmered in Coffee. FYI, all McCropders (sans Cropsey kids) are currently enjoying WMM orientation in Boone, NC. Will tell more later, but it is great thus far. 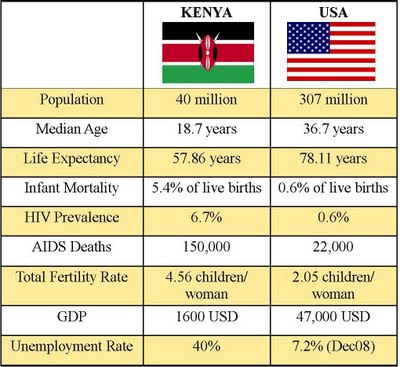 In conversation with people since putting up the prior Kenyan statistics, it became evident that it might be useful to have a handy comparison with something more familiar, i.e. the USA. As much as the health figures are always striking to me as a physician, the economic figures are especially striking in our particular cultural moment. As before, source is the CIA world factbook. Since the above chart included figures on HIV prevalence (% of living people currently with the virus) and AIDS deaths, I thought I'd include the visual comparison below, from www.worldmapper.org, which is a world map where the countries size is proportional to its number of AIDS deaths. Kenya is the big bright red one close to India.